A girl, a toad, summer funfair, and ice-cream.. 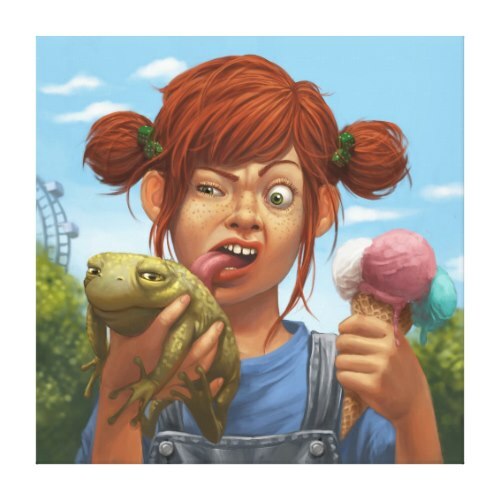 Funny, hilarious, cartoon art wrapped canvas, featuring a girl at a summer funfair, with a just bought three scoops ice-cream waffle cone in one hand and a big green toad in the other, licking the toad instead. The fun, humorous art by Daniela Uhlig, presents the hilarious whoopsy daisy moment - the expression on the kids face with the first lick midway, and the contentment on the toad's. A fun, colorful wrapped canvas to add a touch of humor to your walls. Great for room decor. Makes a fun gift for friends and family.